Place the egg yolks, lemon juice and melted butter (the heat from the melted butter cooks the yolks) in a food processor. Process until thick and creamy. Break the eggs, one by one on a plate or in a bowl. Use a spoon and spin the boiling water to slightly cool. Slide the egg into the centre of the whirlpool. Cook for 3-4 minutes until set. Work quickly to transfer each egg onto a plate, letting excess water drip back into the saucepan. Poached eggs should be served as soon as they are removed from the water as they get cold quickly. 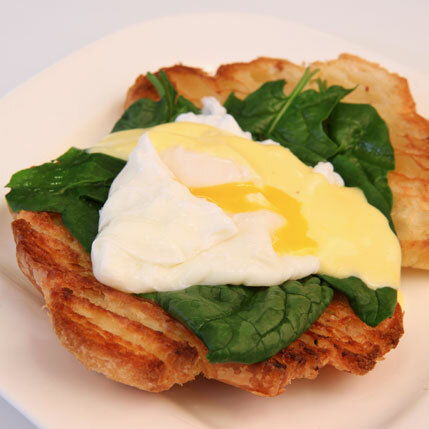 Top the toasted croissant with blanched spinach, a poached egg and spoon hollandaise over. Sprinkle with black pepper and serve immediately. Top with Parmesan shavings for a piquant taste.